Gr8 to see so many people supporting Bled. In fact this would sound strange some time ago, but I think people in Slovenia get massively interested in volleyball. The same situation we had in late 90s during the WL. Big volley boom in Slovenia ...just like in 2002 in Poland (Katowice against Brazil in WL)...keep going! 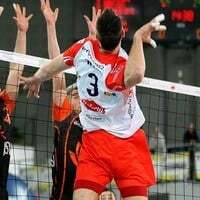 I very like reaction of the public after block on opposite player. When so many people are doing this it's great effect.